'Picturesque' features ornate butterflies, that have been created using semi-opaque colour within a silver plated framework, allowing the light to shine through producing a stained glass effect - really very beautiful. Finished with Swarovski crystals, enamels and various glass beads - this series will not disappoint! 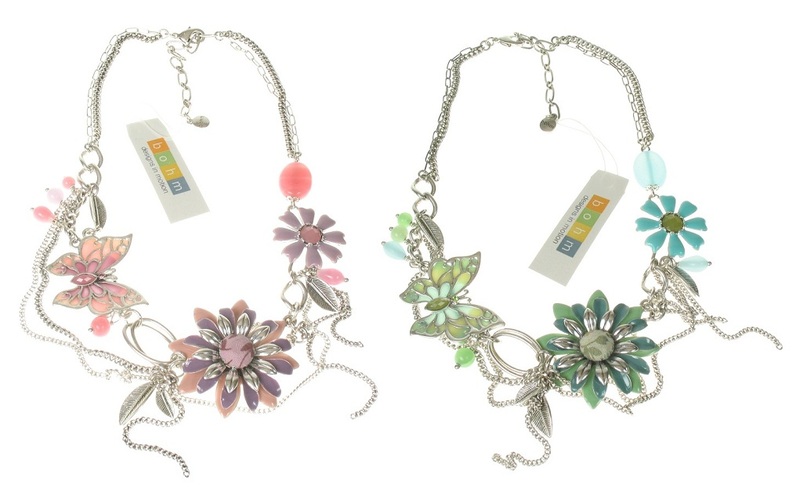 Available in satin silver plate with either shades of purple/pale pink OR aqua/green. Beautiful butterfly pendant necklace by 'The Bohm', with Swarovski crystals, glass beads and hand-applied enamel details. Butterfly measures 6cm/60mm. Hung from double chain that is 16 inches/41cm to an adjustable 19 inches/49cm in length. Beautiful butterfly bracelet by 'The Bohm', with Swarovski crystals, hand-applied enamels and glass bead details. Butterfly measures 3cm/30mm. Length 7.5 inches/19cm to an adjustable 9 inches/23cm. Beautiful butterfly ring by 'The Bohm', with Swarovski crystals and hand-applied enamel details. Butterfly measures 4cm/40mm. The band is 2.5mm wide and is adjustable - adjusts from the back. Beautiful butterfly hair band by 'The Bohm', with Swarovski crystals and hand-applied enamel details. Butterfly measures 3cm/30mm. 15 inches/38 cm in length. It expands comfortably to fit. 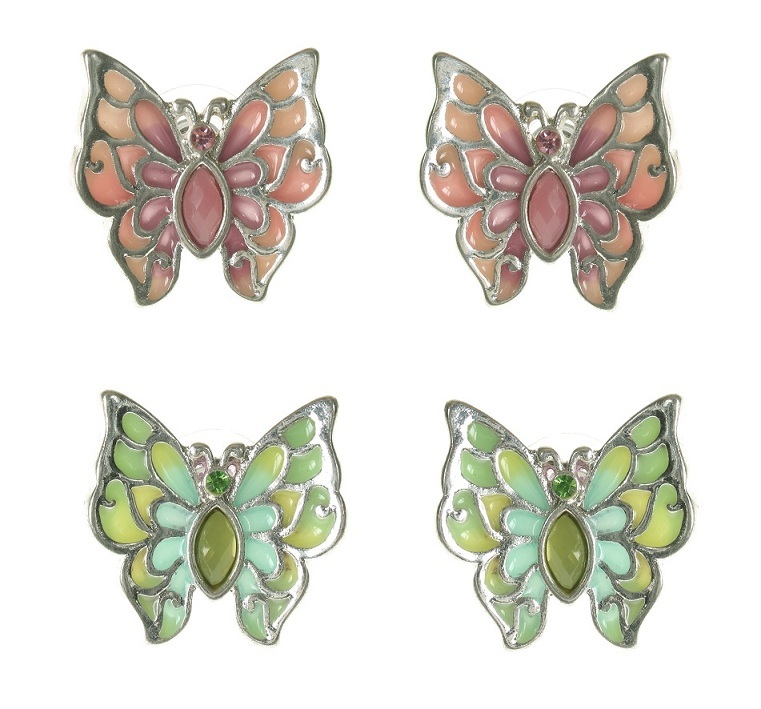 Beautiful stud style butterfly earrings by 'The Bohm', with Swarovski crystals and carefully hand-applied enamels. Butterfly measures 2cm/20mm. Stud style for pierced ears. Beautiful and very wearable elaborate butterfly and flower necklace by 'The Bohm', with Swarovski crystals, fabric centred flowers and hand-applied enamel details. The various motifs measure from 2.7cm/27mm (smaller enamelled flower) upto 4cm/40mm (the larger flower). The length is 16 inches/41cm to an adjustable 19 inches/48cm. 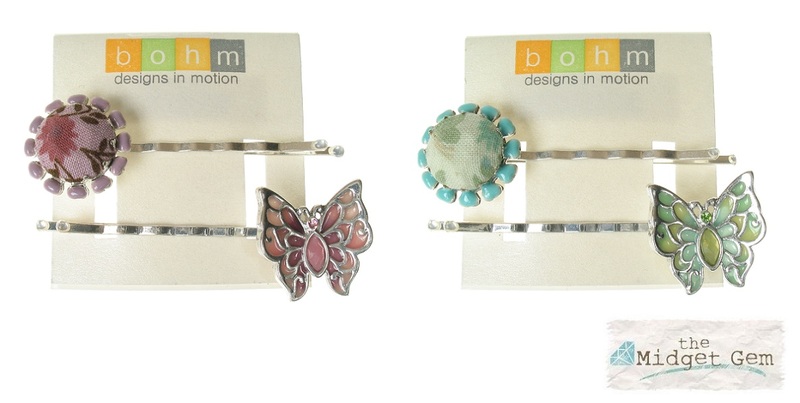 Beautiful butterfly and flower hair clips by 'The Bohm', with Swarovski crystals and carefully hand-applied enamels. Butterfly measures 2.3cm/23mm and the flower 2cm/20mm. Clips are 5.5cm/55mm in length and are intended to hold a small amount of hair.